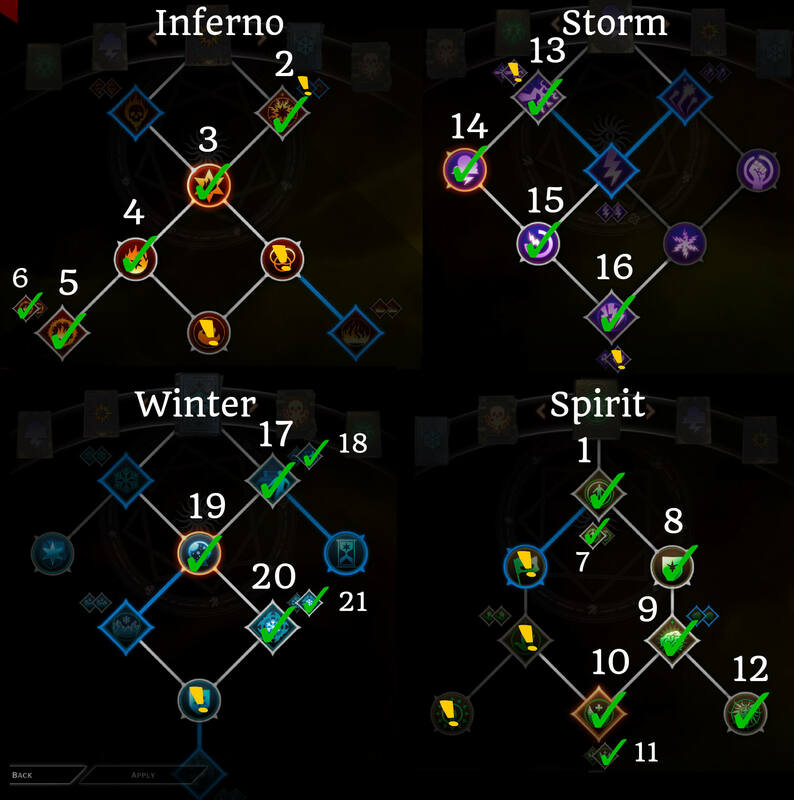 Looking for effective DA: Inquisition mage builds? You’ve come to the right place. All of these builds have been tested & played extensively on Nightmare difficulty. 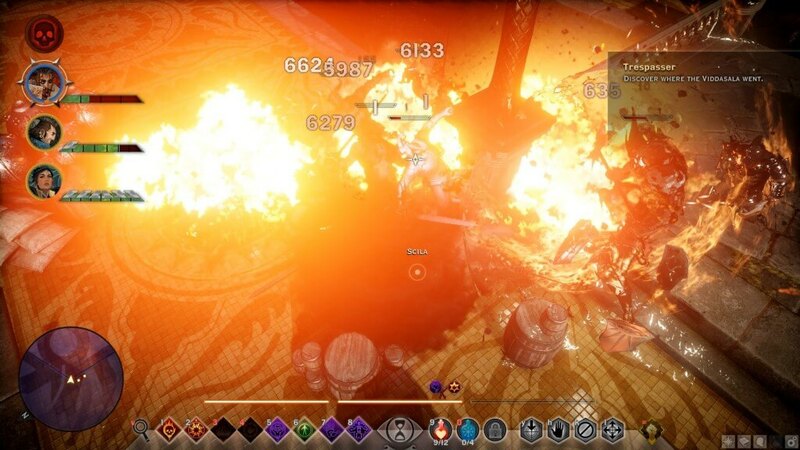 This build requires one specific item to work – the Ring of Doubt, one of the 4 Relics of Thedas items added in Patch 10. It is also a lot more powerful if you have the Trespasser DLC (for the Flaming Array Fire Mine upgrade), but it’s viable with the standalone game as well. 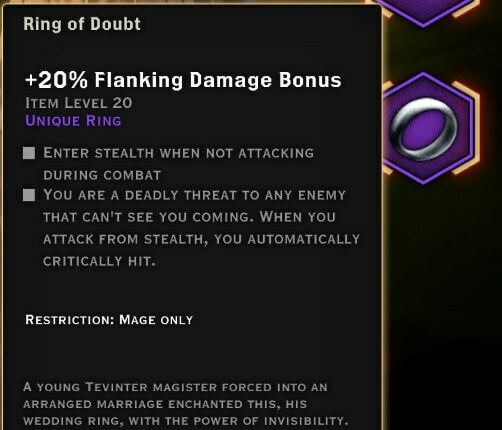 The basic idea behind the build is that Ring of Doubt gives you stealth when not attacking, and the first spell you use of of stealth will always crit. This works incredibly well with Inferno’s Flashpoint passive, which causes the next spell after a critical hit to have no cooldown. So what you do is get into combat to trigger the ring’s stealth effect, use Immolate to trigger Flashpoint, and wait until you stealth again. This allows you to cast Fire Mine twice, and also guarantees that it will crit both times, causing massive damage. You can easily wipe out whole groups of enemies even on Nightmare difficulty by using this combo. Make sure to wait to restealth every time you cast a spell so that it crits. For even more damage, keep Barrier up to boost your fire damage with the Chaotic Focus passive, and try to flank your enemies to make use of the ring’s +20% Flanking Damage bonus. This build requires only 11 points, so you can pair it up with any mage specialization! 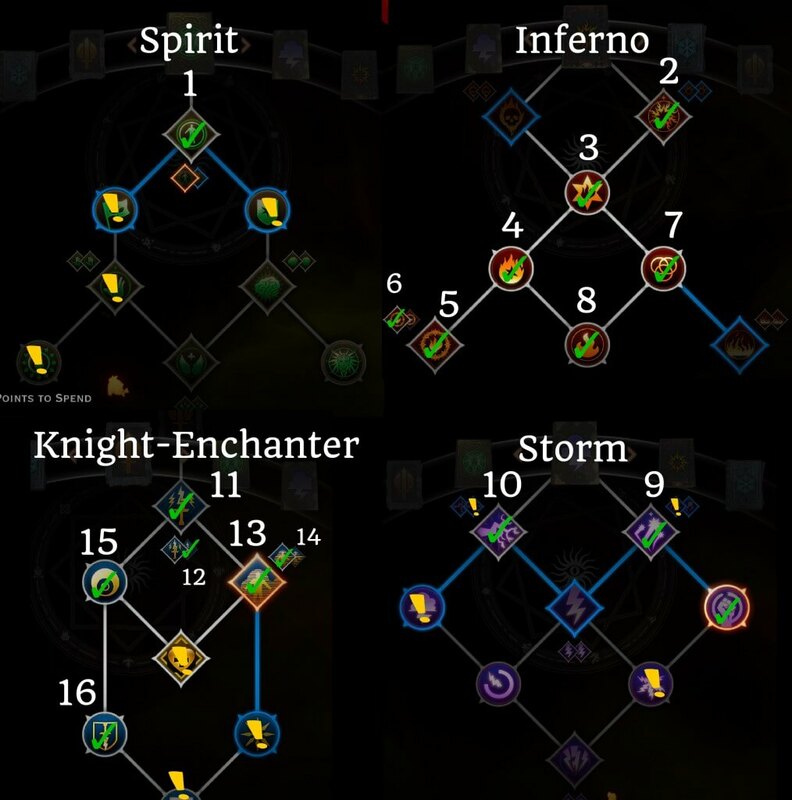 I’ve been wanting to try a build that doesn’t require any specializations for the mage class, and this was the result. 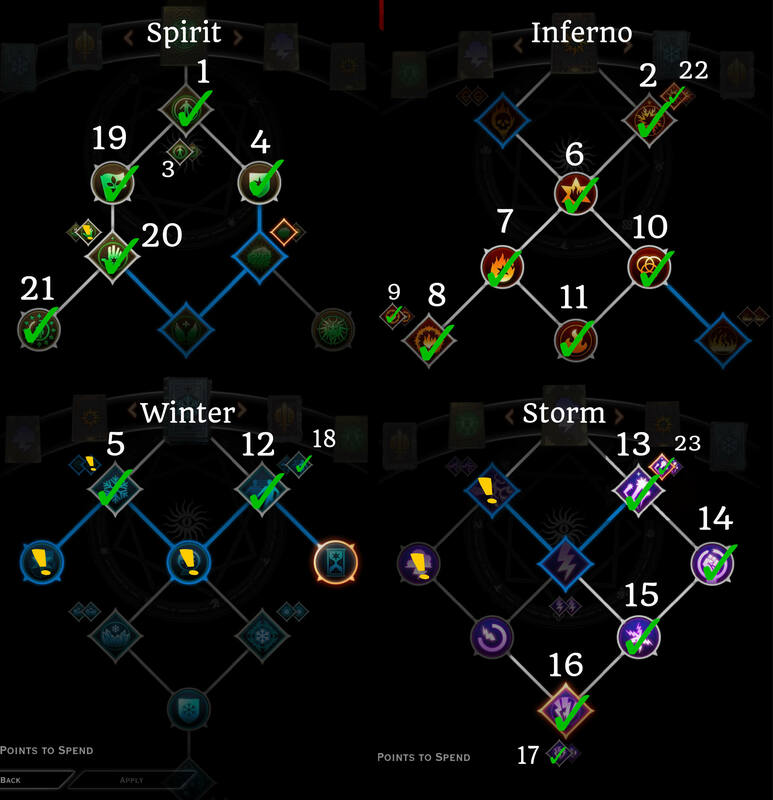 This build takes spells in every mage tree (Spirit, Storm, Inferno, and Winter) with the aim of having access to a lot of different tools. You have some CC, some mobility, some support, access to different elements to help against enemies that are strong/weak against particular schools, and most of all high damage! You can take Guardian Spirit later in the game if your mage has no survivability problems, and also experiment with taking Energizing Step (Fade Step upgrade) earlier if you’re having mana problems. For your 8th skill slot, you can either use Dispel (great for things like dispelling Rifts and barriers) or Mark of the Rift. Rejuvenating Barrier + Energizing Step help with mana regen since this build is mana-intensive. Static Cage’s Lightning Cage skill upgrade adds additional lightning damage whenever a target inside takes damage. This makes Fire Mine and Energy Barrage excellent spells to combo together with Static Cage. Chaotic Focus + Barrier to power up your Fire Mine to do more damage. In terms of crafting Masterworks for this build, you have two options: if you still have mana issues, try a Masterwork like Fade-Touched Plush Fustian Velvet (reduces ability cost by 10%); otherwise go for a pure damage Masterwork. Check out the full list of Masterworks here. This build is all about AOE damage and control. The Winter, Inferno, and Rift trees offer the most AOE capability for mages, so these 3 will be our key skill groups, offering unrivaled control and damage against multiple enemies. This build can be finalized in 2 different ways: by either going for Blizzard + Ice Storm upgrade, or Veilstrike + Punching Down upgrade. I personally prefer taking Veilstrike so that I have 2 skills that cause the weakness debuff (Veilstrike & Stonefist), which most of the passives in Rift rely on. For your focus skill, you can either take Firestorm or Mark of the Rift, depending on whether you’re using this build on Solas or your Inquisitor. To conclude, you will notice that the core build requires only 16 points; I decided to make it as accessible as possible since KE is such a popular spec. Because of this, you have lots of ways to spend your later points (marked by the yellow exclamation mark in the build screenshot above). If you’re looking for more damage, I would take the optional Storm skills ; if you’re struggling with mana/survivability, I’d take the optional Spirit points instead. This build is all about supporting your party, both to keep them alive, and to set up combos so they can deal high damage. As such, we will be taking as many mage combo setup skills as possible, like Ice Mine and Static Cage. I prefer to use this build on Solas and leave the AI to control it, but you can use it with any mage companion (or your Inquisitor). When leveling with this build, you have lots of freedom with which skills to take first. For example after taking barrier, you can take the Storm skills before Winter, or take all the Spirit skills before Winter/Storm. However, I would recommend building it in the above way to have a solid mix of both support and CC skills as you level up, rather than too much of one thing. Note: take Mind Blast off your action bar so you can use your 8 most important skills. Pairing Necromancer skills together with Inferno is the best choice, because fire spells cause burning (another DoT) and Wall of Fire benefits from the 15% bonus damage to panicked enemies passive in the Necro tree. If you have the Trespasser DLC, you definitely want to pick up fade step with the new energizing step upgrade to take care of mana issues, since Necromancer spells cost a lot of mana. You also want to pick up the new upgrades for Fire mine (Flaming Array) and Wall of Fire (Wave of Flame). For Spirit Mark, you can try out using either skill upgrade; they’re both buggy at the moment so I didn’t see either one of them being stronger. For your Focus skill take Haste only if you’re doing this build on Dorian; otherwise, Mark of the Rift is superior.